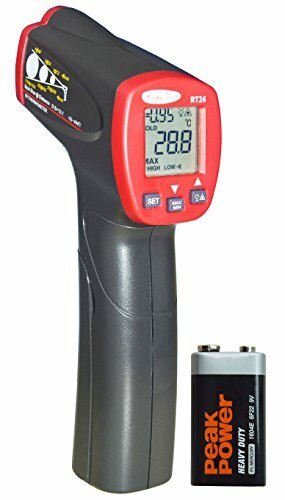 RockyMars RT26 Non-contact Digital Laser Infrared Thermometer with Laser Sighting for Use in Monitoring Electrical, Mechanical, HVAC and Automotive Systems, etc. RockyMars® RT26 is a handy non-contact infrared thermometer with high durability and accuracy to provide precise and repeatable measurements for use in monitoring electrical, mechanical, HVAC, and automotive systems, etc. It comes with laser sighting so you always know you are measuring the right spot. Just point, aim, click, and you complete the measurement in a second. Accuracy: +/- 2°C or +/- 2% of the reading. Measures temperature from -32°C to +400°C (-25.6°F to +752°F) with an accuracy of +/- 2°C or +/- 2% of the reading. Large backlit display. Audible Hi and Lo Alarms. Adjustable Emissivity. Battery Low indicator. Battery Included. If you have any questions about this product by Rocky Mars, contact us by completing and submitting the form below. If you are looking for a specif part number, please include it with your message.